Read a full summary of Children of Blood and Bone, book #1 of Tomi Adeyemi’s Legacy of Orïsha series, right here! This page is full of spoilers so beware. If you are wondering what happened in Children of Blood and Bone, you are in the right place! What happened in Children of Blood and Bone? Zélie is a divîner (a white-haired, would-be maji whose powers have been suppressed) who lives with her brother, Tzain, and father. Her father is losing his mind after the death of his wife, Zélie’s mother, who was killed in the Raid to rid Orïsha of all maji. Zélie has just graduated and earned her staff when guards come to demand tax from her family. She goes to trade in the city to try to come up with the money and she runs into princess Amari who has recently stolen a powerful scroll that has the potential to bring magic back to Orîsha. If touched by a divîner it will transform that person into a maji. Amari is daughter to King Saran, who orchestrated the Raid. Amari witnessed her father killing her best friend and maid, who was a divîner. Thus she took the scroll. Zélie helps her get away from the guards who are led by Amari’s brother, Inan. This is before she realizes that Amari is a princess. When she finds out her attitude turns bitter. They return to Zélie’s village, Ilorin atop Nailah, their lionare (a giant horned cat). She speaks with Mama Agba who confirms that the scroll does have the power to bring magic back. It restores some of Mama’s power and she brings forth a vision of the future. One in which Zélie, Tzain, and Amari travel through the jungle to the hidden temple. King Saran sends Inan, and Commander Kaea to retrieve Amari and the scroll. They accidentally burn down Zélie’s entire fishing village in their search. Zélie, Tzain, and Amari escape and begin their quest but Inan visits Zélie in her dreams. He has a secret. To his horror, he is learning that he is a maji and his powers are coming forth. After he touched the scroll a white streak appeared in his hair and he sees visions at inopportune times and can even hear thoughts. At first, he thinks that Zélie is doing it, but soon he realizes the truth. He is determined to find her and kill her and to also kill magic to end his curse. The three travelers trade Amari’s dress and headdress for enough money to fund their travels. This trade leads Inan to them. Amari bears a horrible scar across her back that was an accident of her brother’s. They were forced to learn the blade by their father. The trio finally reaches the ruins of Chândomblé and discover that a sêntaro named Lekan remains. His brethren were killed in the Raid. The sêntaro were meant to be spiritual guardians of the magic. He tells them that the Sky Mother created the gods in her image. Oya, the goddess with power over death is one of them and is the origin of Zélie’s power. The sêntaro are led by the mamaláwo. The mamaláwo is to perform a ritual once a century to keep the magical tether between the maji and the gods. For this, she uses the scroll, the bone dagger, and the sunstone. King Saran learned of the ritual and had the mamaláwo and the séntaro killed thus breaking the tether. He tried to destroy the artifacts but did not succeed. The three companions must find the missing sunstone (which is a piece of the Sky Mother’s soul) and perform the ritual before the centennial solstice. But first Zélie undergoes an awakening to connect her to the Sky Mother. Lekan performs the ritual which leaves Zélie weakened for a time. Unfortunately, this is the moment that Inan catches up to them with his guards. The temple ignites his own powers as well. Lekan dies in their defense but the trio and the lionare barely escape. Inan determines that he may need to use his secret magic to kill Zélie. With it, he is able to sense her and determine where she has gone next. The trio travels to Ibeji which is a desert city that holds an enormous coliseum. There are numerous slave workers here who seem to be very mistreated. They are told that they have a chance at freedom and eternal life if they fight in the coliseum. Eternal life is granted by a stone—the sunstone. They watch one of the competitions where crews on boats fight to the death. No one ever lives to win. The spirits of the dead nearly drive Zélie mad. Inan learns that his gift originates from the God of mind, spirit, and dreams. He is angry with the God. Inan continues to visit Zélie in her dreams and eventually learns where they are but Commander Kaea finds out what he is and Inan accidentally kills her with his untrained magic. Inan blames Zélie. Zélie and her friends try to steal the sunstone but they are unsuccessful. To Amari’s dismay, Zélie enters them into the competition. They plan to use Zélie’s magic. With much trouble, Zélie is able to raise an army of the dead to help them. In the end, Amari is the one to kill the other captain making them the winners. They share the prize money with their crew and obtain the sunstone. The city celebrates well into the night, naming Zélie the Immortal, Tzain the Commander, and Amari the Lionaire. They continue their travels the next day armed with the three artifacts: the scroll, the bone dagger, and the sunstone. They must go to the Holy Temple on an island that only appears at the solstice to complete the ritual. Inan catches up to them and he and Zélie fight. While they are distracted, Tzain and Amari are captured by a band of forest people. Inan and Zélie agree to work together to get their siblings back. Zélie raises an army of the dead to help them breach the hideout where Tzain and Amari have been taken. They finally learn that the forest people are a group of divîners that have been awoken because they touched the scroll before king Saran got his hands on it. Their leader is a girl named Zu. Zu agrees to help them on their quest with whatever they need. First, they will have the celebration of Àjoyò, which commemorates the Sky Mother and the birth of the gods. In this time Inan learns the error of his ways and begins to trust Zélie and thinks about a future where he is a fair king to all people. Tzain still does not trust him and so gives Zélie the silent treatment for being so quick to dismiss his crimes. Zélie meets a foreign pick-pocket called Roën. She then helps Inan to control his magic. Because he constantly suppresses it, he is usually in pain. Zélie questions whether giving all of the divîners their power back right now is the wise choice. She does not share the scroll with them. Tzain sees Inan and Zélie kissing and decides he can’t stick around to watch his sister make this mistake. He packs up and leaves and Amari runs after him. While they are away from the group, Saran’s soldiers arrive. They kill Zu as she tries to reason with them and the fighting breaks out. Many die and Zélie is captured. Tzain, Amari, and many divîners make a plan to break Zélie out of the guard fortress they took her to. Zélie is tortured and they carve the word “maggot” on her back. To her surprise, Inan is there and has returned to his father’s good graces. He tries to get Zélie to tell her how to destroy the scroll. Inan, however, finds the right opportunity and breaks Zélie out of her cell just as Tzain and Amari show up with some of Tzain’s old fighting buddies. They awaken their magic using the scroll. Inan turns Zélie over to them but decides to stay with his father. He did this last thing for Zél but he has seen that magic cannot remain. He fears it too much. When Zélie wakes she realizes that her magic is gone. She keeps this a secret from the others but continues on trusting that the gods have a purpose. Their group travels to Jimeta, a lawless city, to find someone to take them on a boat to the temple island. To Zélie’s surprise, they approach Roën, the foreign pick-pocket, who happens to be the leader of a group of mercenaries. Zélie convinces the group to help them. As they travel by boat, at least a dozen of the king’s battleships approach. Roën and his men take one of the battleships and they travel in disguise with the king’s warriors. They are able to dock and hike to the temple unimpeded. How did Children of Blood and Bone end? When they enter the temple though, they are ambushed. Saran and Inan and their soldiers are there. And to Zélie’s dismay, they have her father. Saran demands the scroll, the sunstone, and the bone bagger in exchange for him. Zélie complies but when the exchange is made, they shoot an arrow through her father’s heart. His spirit awakens Zélie’s magic and she is able to call an army of the dead to their aide. Inan is desperate to destroy the scroll and so he provokes Zélie into attacking him. He uses her magic to destroy it. A mercenary tries to kill the king but Inan uses his magic to stop him. When the king sees that Inan wields magic he turns on Inan determined to kill him. Amari steps in and kills her father. She will be queen. Zélie tries to mend the scroll but it does not work. The solstice begins and the statues of the gods within the temple begin to glow. Zélie uses her magic to call on her ancestors to forge a new connection with the gods. The incantation is unlike any the spirits have ever seen. Zélie speaks with her mother who tells her that soon enough she will learn what it is that she has done. Zélie tries to stay with her mother—to stay safe for once, but her mother tells her that it’s not over. It’s only just begun. In the epilogue, Zélie awakes to find that Amari now has magic and a streak of white hair like her brother. There you go! That’s what happened in Children of Blood and Bone. Hope you enjoyed this Children of Blood and Bone summary with spoilers. 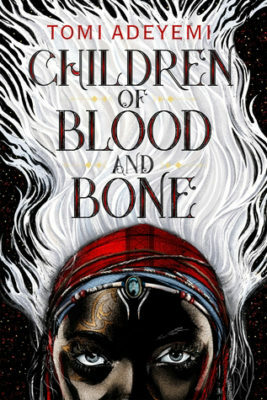 Ready to read or reread Children of Blood and Bone? Click to buy and help us pay for hosting! Friend us on Goodreads: Sara and Stacy. Oh and share this with your friends who might like to read a recap of Children of Blood and Bone. Nice job on the review. I think the part about the burner being able to destroy platoons of men was important enough to include in the review. Also, you mentioned that the king was determined to kill his son but Amari steps in as if she saves her brother. This was not the case.